I am currently really excited by the thought of making my own bread, by hand not with a bread machine. I regularly make Irish Soda Bread and a variant using cheese but wanted to try something completely different. 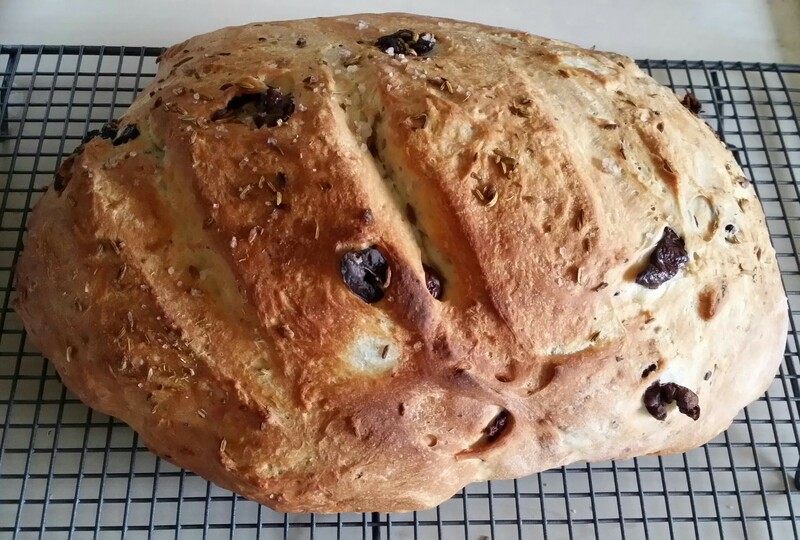 I found a recipe for a roasted fennel seed bread online which just seemed a bit plain, so I jazzed it up with some olives. Sift the flour and salt into a large bowl and stir in the sugar and yeast with half the fennel seeds, 1 tbsp of the oil and 425ml of lukewarm water. Mix to a soft dough, then transfer to a floured work surface and knead for 6-8 minutes, until smooth and elastic. Knead in the olives until evenly distributed. Place in a clean, oiled bowl and cover with a clean tea towel and set aside in a warm place for 1-2 hours or until doubled in size. Turn the dough out onto the work surface and knead again briefly. Shape into a sausage shape about 32cm long, slash the top a few times with a sharp knife and transfer to a lightly oiled baking sheet. Scatter the rest of the fennel seeds and a little flaked sea salt over the top. Drizzle over the rest of the oil. Cover with a tea towel again and leave to rise for 20 minutes. Preheat the oven to 230°C, gas mark 8. Bake the loaf for 30-35 minutes or a bit longer if your mixture is a tad dense It should have risen and be golden and also sounds hollow when tapped on the base.